Who would have thunk it? Americans have discretionary income to spend‼️According to Gallup poll Americans spend nearly $100 a day on stuff beyond normal monthly bills and major purchases. Even middle and lower-income consumers’ daily spending reports averaged $80 in August, compared with $75 in July. Of course these are averages and no doubt there are wide variations, however it’s pretty clear that most middle class Americans could squeeze out a few more dollars to save 💰💰💰 if they wanted to. WASHINGTON, D.C. — Americans’ self-reports of daily spending averaged $94 in August, matching the average for July. Spending last month was also similar to the $95 average in August 2013. These figures are based on Gallup Daily tracking interviews with more than 15,000 Americans throughout August. The poll asks Americans to report the total amount they spent “yesterday” in stores, gas stations, restaurants, or online — not counting home and vehicle purchases, or normal monthly bills — and gives an indication of discretionary spending. Throughout 2014, the monthly averages in Americans’ self-reported daily spending have consistently exceeded figures in the same months for each year from 2009 through 2012 — both during and after the recession. But spending is still below the $100 averages routinely seen in 2008 before the financial crisis occurred in the fall. In May of this year, spending nearly reached the $100 level, peaking at $98. After dropping to $91 in June, average spending recovered somewhat to $94 in July and was flat in August. Last month’s spending average ($94) is nearly identical to August 2013 spending ($95). 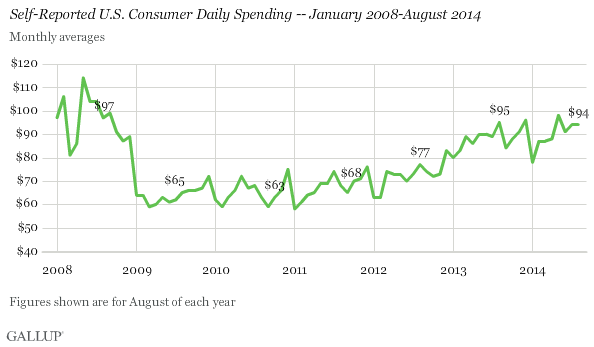 But last August was the second-highest spending month for Americans in 2013. How this measure tracks over the next few months will indicate whether spending in 2014 has, in fact, steadied at the higher levels reached in late 2013, or whether the momentum seen earlier this year picks up again.